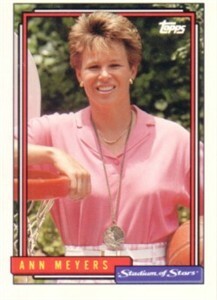 Rare 1992 Topps Stadium of Stars card of UCLA Bruins legend and Basketball Hall of Famer Ann Meyers Drysdale. Topps produced a small set of various celebrities and distributed limited quantities at the 1992 National Sports Collectors Convention in Atlanta. NrMt-Mt (back is off-centered). ONLY ONE AVAILABLE FOR SALE.